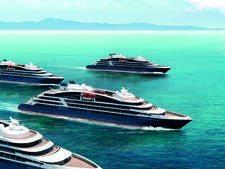 Launched in 2011, L'Austral is the second in a series of three 264-passenger, 10,600-ton cruising yachts commissioned by Compagnie du Ponant. Identical ships in the class include Le Boreal, which debuted in 2010; Le Soleal, which launched in July 2013 and Le Lyrial, from 2015. Originally French-owned and, at one point, aimed almost exclusively at the French market, the company was acquired by cargo giant CMA CGM in 2006 and then sold on to pan-European private equity investor Bridgepoint Capital in 2012. Over the last few years, and particularly with the launch of these three new ships, the line has been targeting a much more international market with considerable success. The essence of the product, however, remains unchanged under the new owners, with a family-run feel and a strong French influence throughout the ships. L'Austral is, without a doubt, a stunning vessel, with sleek lines and an unusual dark-grey hull that makes it stand out in port. The interiors are like those of a minimalist boutique hotel. Everything is taupe, cream and white, with emphasis on luxurious textures, from leather-fronted white drawers in our cabin to taupe silk cushions on the bed. Black-and-white Philip Plisson photo art lines the corridors. A cascade of glittering Swarovski crystals lights up the small atrium. The whole package is unashamedly French: it's chic, the service is a little arrogant at times, and the passengers are a well-heeled, savvy crowd of experienced travelers. 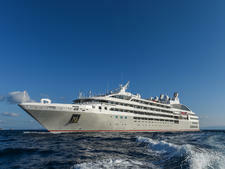 What distinguishes these ships from other luxury vessels is their adventurous itineraries. 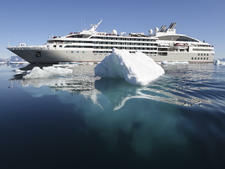 L'Austral and its sisters are all ice-strengthened, so they can sail to Antarctica and the Arctic, destinations that are mixed up with off-the-beaten-track European itineraries, as well as Asia and South America. Each carries a fleet of Zodiac landing crafts for getting ashore and for sightseeing in remote locations. There's a strong emphasis on coastal cruising, with long days in port, overnights and late departures, so you really feel you're part of a destination, rather than just calling for a day. 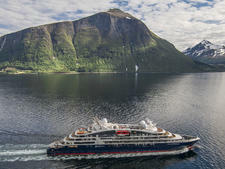 Compagnie du Ponant operates a complicated pricing policy and is moving toward all-inclusive drinks, but at present that's only for certain markets. For the U.S. market, the fares are already all-inclusive. For the U.K. and European markets, wine and soft drinks with meals are included, and there's an optional all-inclusive upgrade of £210 (for Brits) for a week. There are, however, plans afoot to make all pricing drinks-inclusive.Wi-Fi is also included in the fare. Note: Tauck charters certain L'Austral sailings, and on these cruises, the onboard atmosphere and pricing structure may change (e.g. excursions are included). 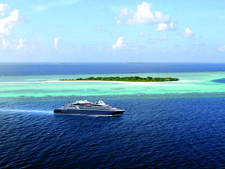 Clientele varies dramatically according to the season, with younger families traveling during European school holidays and older couples attracted to the longer cruises to more remote locations. On our Mediterranean cruise in August, about 60 percent of the passengers were French; the remainder hailed from the U.S., U.K., Germany and countries as far afield as Japan and Brazil. Language wasn't an issue. The maitre d' will seat you on an English-speaking table at dinner if you ask, and all the mainly Indonesian crew speak English (often better than they speak French). There will always be English-speaking excursions when there are international passengers onboard, and announcements are made in English, as well as in French. Several passengers were traveling in extended family groups, and kids ranged from 7 or 8 years old to teenagers. All the children were well behaved, and the teens certainly livened up the dance floor at night. A word about smoking: All the inside areas of the ship and cabin balconies are nonsmoking. But on my cruise, there were a lot of smokers, and the outdoor bar and the outdoor lounge area behind the Karikal lounge were often places smokers would congregate, including the officers, many of whom smoked. Naturally, this will vary from cruise to cruise, but for anybody who really objects strongly to smoking in any shape or form, it might be worth bearing in mind. Dress code is smart-casual with a couple of extra-smart nights (although no rules are laid down). Passengers were seriously chic, and ladies are advised to pack a cocktail dress and some heels for the smarter nights, which brought out the Louis Vuitton and Missoni. The small onboard shop sells designer labels -- Faconnable and Lacoste -- and a fashion show laid one night by the onboard dancers modeling the shop's wares set the sartorial tone. (The shop was, however, barely open, should you have wanted to buy the goods.) There's no requirement for men to pack jackets and ties, although a lot of men did wear summer blazers on the smart nights. Gratuities are not included. Envelopes are left on beds on the penultimate night for cash, which is posted into a box at Reception. There was no pressure at all for tips throughout the cruise, and service charges are not added to bar drinks. The recommended amount for those who do want to tip is €10 a day. The onboard currency is the euro. Measuring just 430 feet, the luxury expedition ship Le Champlain features 92 cabins and suites with a crew complement of 110. 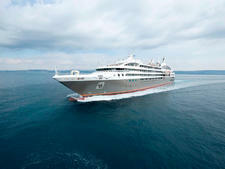 Launched in 2018, Le Laperouse is the first of Ponant's six Explorer-class expedition ships. It is named for French explorer Jean-Francois de La Perouse. A beautifully appointed luxury yacht with two restaurants, swimming pool and spa, as well as a marina for water sports; strong French influence. 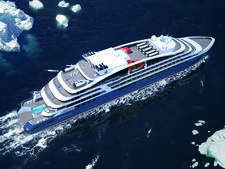 Launched in 2009 and ice-strengthened for Arctic and Antarctica itineraries, Le Boreal was the first in a series of 264-passenger cruising yachts commissioned by Ponant. A luxury expedition yacht with an ice-strengthened hull, two restaurants, swimming pool and spa, as well as a marina for watersports; strong French influence. 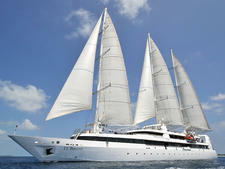 The 64-passenger Le Ponant is a three-masted sailing ship that sails for Ponant, and is also chartered by other cruise lines, including Tauck. Featuring two restaurants and a special "underwater lounge," this luxury expedition yacht has an infinity pool and watersports marina. This luxury expedition yacht features two restaurants, infinity pool, watersports marina and a special "underwater" lounge.